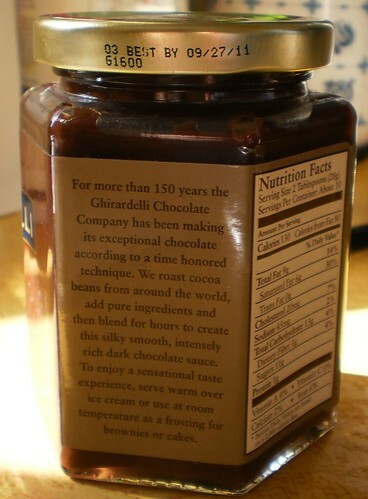 I bought 5 jars of this Ghirardelli Chocolate sauce for Carole's wedding last year. We only used a total of 1 whole jar although 2 were opened. So, I brought 3 back. Big deal. It's hot fudge. Well, I really shouldn't be having hot fudge on everything in order to use these up. It took probably 4 months to use up one jar. I had to have Mike open this one because I just can't do it anymore. I need to find one of those circles, Mike calls them 'bologna slices' because that's what they look like to him, that help you open jars. I don't like bringing them into the office although the guys will make a big deal out of opening my jars. After Mike opened this, I noticed the "best by" date on the lid had passed. Hmmmm. It should still be good. I can't toss all this hot fudge. The jar was sealed. It made that pop sound when he opened it. I don't have enough ice cream in my fridge to eat all of this, nor do I want Ghirardelli hot fudge every dinner until this jar is gone. AND...I have another jar in the basement. Methinks I'll need to get creative.